The story of 2008 Olympic Champion gymnast Anastasia “Nastia” Liukin is that of the true American dream. Born in Moscow, Russia to Valeri and Anna, both champion gymnasts themselves in their native country, the Liukin’s moved to the U.S. when Nastia was two & a half years old, wanting to give their daughter every opportunity. Valeri won four medals including two gold at the 1988 Olympics in Seoul, and Anna is the 1987 rhythmic gymnastics World Champion. The family moved to New Orleans before settling in Texas. 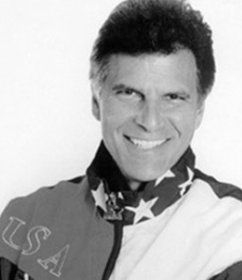 In 1994 Valeri along with a former teammate opened WOGA in Plano, TX. As the daughter of two champion gymnasts who also became gymnastics coaches, it was only natural that Nastia found herself in the gym from a very young age. Unable to afford a babysitter during their early years in the USA, Valeri and Anna brought Nastia to the gym while they worked. The gym was the ultimate playground for Nastia. Her parents, all too aware of just how tough the sport can be, never intended for Nastia to become a gymnast – certainly not at the elite level. However it was difficult to ignore her talent and desire to be involved in gymnastics. Valeri became Nastia’s coach. Nastia began competing earlier than most at the age of six, and by the time she was twelve, she was an Elite gymnast. Throughout her career, Nastia was a key member of the U.S. team. Nastia has won nine World medals (four gold & five silver), which is tied for second most all time with Shannon Miller, and five Olympic medals, making her one of the most celebrated gymnasts in U.S. history. She competed in her first Jr. National Championships in 2002 at 12, and despite a disappointing performance, she landed one of the final spots on the Jr. National Team and was chosen to compete at the 2002 Jr. Pan American Games, where she contributed to the team gold medal, and placed second on the bars, beam and all-around. By 2003 Liukin was one of the strongest Jr. gymnasts in the country. She won the Jr. National Championships as well as gold medals on bars, beam and floor. She later repeated again in 2004. She was a member of the gold-medal winning team at the 2003 Pan Am Games, taking 2nd place all-around. In 2005 Liukin won her first Sr. National Championships. At the 2005 World Championships in Melbourne she finished 2nd all-around behind teammate Chellsie Memmel, and won gold on bars and beam, along with silver on floor. In 2006 Liukin won the American Cup, and tied for first all-around with Memmel at the Pacific Alliance Championships and also won the bars title. At the 2006 National Championships, Nastia defended her all-around, beam and bar titles. She was named to the 2006 World Championships Team and was considered a strong contender for the all-around title but, an ankle injury sustained in training before the competition began limited her to competing on only the bars, and she helped the team to a gold medal, along with an individual silver on bars. Liukin’s ankle injury required surgery and the recovery kept her out of competition for much of the next year. In July 2007 she returned to compete at the Pan Am Games, competing on only bars and beam, contributing to the team gold and winning silver in bars and beam. Despite limited training, she opted to compete all-around at Nationals and placed third. Following Nationals she helped the 2007 World Championship team to another gold medal and she regained her World Champion title on the beam. Her first meet of 2008 was the American Cup which she won. She finished second at the National Championships in Boston complete with another national title on the beam and her fourth consecutive title on bars. A few weeks later at the U.S. Olympic Trials, Nastia finished second and was named to the 2008 U.S. Olympic Team for the 2008 Olympic Games in Beijing, China. The 2008 Olympic Games was quite a thrill for Nastia, who was instrumental in USA’s success. Nastia led the team to a team silver medal, being edged out by China. Individually, Nastia she won a bronze medal on floor, silver medal on balance beam and uneven bars, and after the performance of a lifetime, won the coveted all-around Olympic gold medal title ahead of teammate Shawn Johnson! Nastia’s all-around win marked just the third time that an American woman had won the Olympic all-around title. Following the Olympics Nastia enjoyed a whirlwind of appearances, engagements, and accolades upon her return, including appearances on television shows, Fashion Week in New York, and even launching her own clothing line, amongst others. Nastia was also featured on the elite Wheaties cereal box. Eventually Nastia decided that she was not done with gymnastics and competed on only beam at both the 2009 CoverGirl Classic and National Championships. She was invited to World Championship selection camp but pulled out as she felt she was not up to standards. Nastia stepped out of the competitive spotlight for the next two years focusing on other engagements until she was ready to put all of her effort into training again with the goal of making the 2012 Olympic Team for the London Games. Following months of training Nastia performed at the 2012 US Secret Classic as a qualification for the upcoming National Championships. She was able to advance to Olympic Trials but was unsuccessful in her attempt to make the 2012 Olympic Team. Upon dismounting from her beam routine, Nastia received a standing ovation from the 18,000 fans in the stands. Despite the end of her gymnastics career, Liukin went to London as the athlete representative for the Federation of International Gymnastics (FIG). Nastia finished her competitive career with five Olympic medals and nine World medals- the second highest total of any U.S. gymnast. After the 2012 London Olympics Nastia headlined the 2012 Kellogg’s Tour of Gymnastics Champions, and in January 2013, Nastia began college at NYU where she is studying sports management. Nastia works as a television commentator for various events, including the 2013 American Cup and U.S. National Championships for NBC broadcasts and she was also a special correspondent for NBC Olympics for the 2014 Olympic Games in Sochi, Russia. Beyond the gymnastics arena, Nastia has embarked on several business ventures including modeling for BCBG/ Max Azria, teaming up with Fisher-Price to introduce a new interactive Dora the Explorer doll, “Fantastic Gymnastics Dora,” launched a line of signature clothing at JC Penny called Supergirl by Nastia, & also has her own signature lines of apparel and equipment with AAI and GK/Elite Sportswear. Nastia is fluent in both English & Russian. She also has a strong interest in fashion, acting, education & philanthropy.